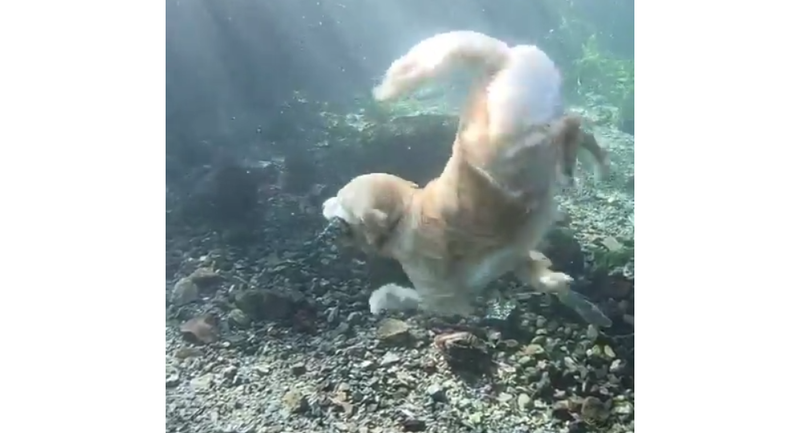 A golden retriever was filmed diving; the pup gracefully dives to the bottom of a pond to pick up a heavy square object which was thrown in as the dog was enjoying a casual swimming session. Golden retrievers were originally bred to retrieve birds which had been shot in or around ponds and lakes by hunters in mid-19th century Scotland. They can be excellent swimmers, and this dog is no exception; he was capable of diving to the bottom of a pond and returning with a heavy-looking square object without any difficulty.